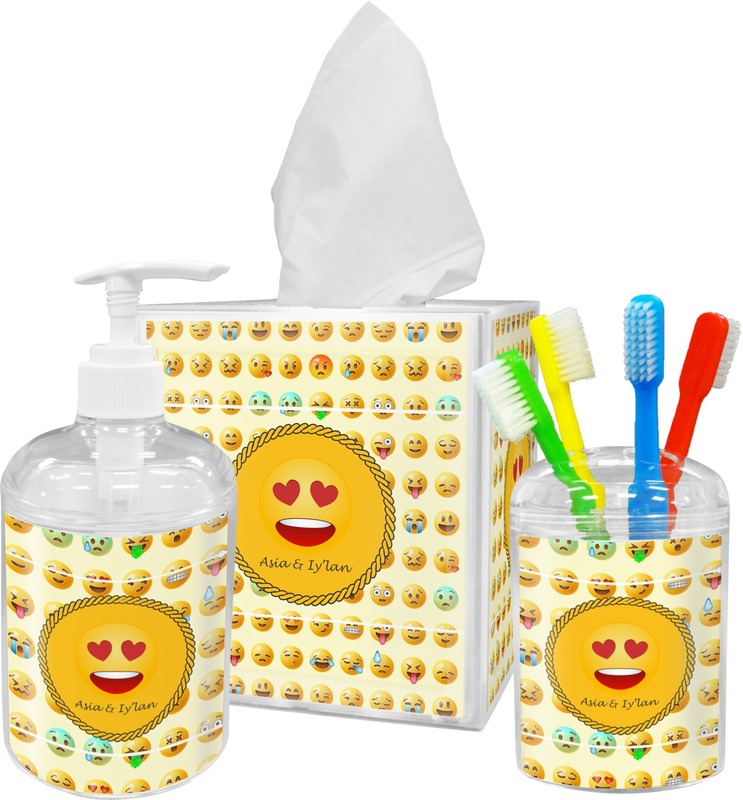 Our personalized bathroom accessories sets make decorating your bathroom with coordinating pieces super easy. 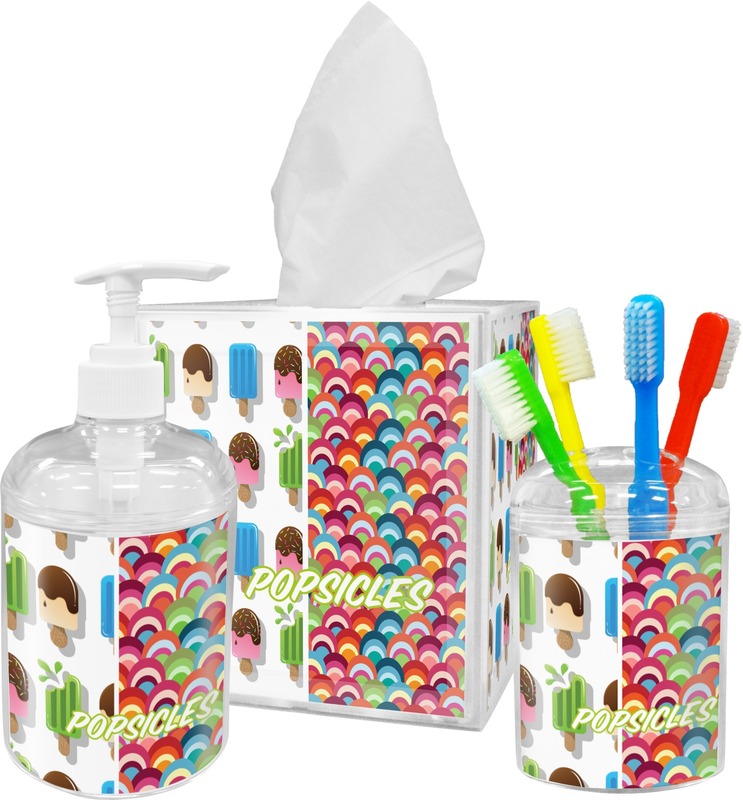 The set includes an acrylic soap/lotion dispenser, toothbrush holder, and tissue box cover AND you save more by purchasing the set instead of the individual pieces. The soap dispenser is sturdy, with a twist off lid for easy filling, a durable pump for controlled dispensing, and holds 9 oz. You can fill them with soap, lotion, or anything else that you would like to dispense with a pump. The tissue box cover shows the design on all sides, has an easy lift off top, and base with non-slip pads on the bottom. The toothbrush holder has an easy twist off lid with 4 holes for toothbrushes. Don't fret if this set is for a shared bathroom, each piece can have two personalizations, or you can put a name on each one!! Write exactly what you prefer in the additional notes box. My Granddaughters love their bathroom set , they couldn’t believe it when they saw their names on it! Thanks for making them feel so specia! A little cheap looking, but I liked the matching design. The soap dispenser and toothbrush holder could have been a bit bigger. The kleenex holder was ok. A bit of a challenge to load. Clever how it is designed with the printed paper to match. For the Ballerina in your life. Beautiful bathroom accessories for the ballerina! Made beautifully and very functional. Great quality and fun for kids! First let me say that this is such a clever idea! My 7 year old just loves the baseball design and having his name on everything. I would have given it 5 stars, except that my son has an electric toothbrush, and as soon as I took the divider off the top the personalized design came off of the toothbrush holder, so maybe just offer a cup for those who have electric toothbrushes as they are very common these days? Was just what was ordered. My granddaughter loves it.